full size. This is the very last thing I have to do before going to bed and getting on the plane and I realized I could’ve put the Impact show on their and didn’t but I’m not going back now. AAA on Televisa is just seeing the first part of Rey de Reyes this week. The episodes have started to go back up on YouTube, so eventually you’ll be able to see them too. CMLL Puebla on Monday has Caristico versus Mistico. Guadalajara’s feed is up, which is good. It’s blocked in the US, which is very much not good. I’d get around it if I was home and paying attention, maybe they’ll fix it themselves. There was an IWRG show last night. None of the usual places have results for it. It’s not a big surprise, it didn’t look all that interesting. It doesn’t leave me much to talk about. New lucha libre site Lucha Central is live with a quiet launch before WrestleMania. I’m sure there will be more promotion down the line. They’ve put up a hard camera version of Fenix vs Flamita from October, the best quality version of that match to turn up. The Wrestling Observer Newsletter mentions both Jack Evans and Angelico asked for their releases from Lucha Underground after Season 4. Angelico was said to be turned down, while Evans believes he’ll be getting released (but had not as of yet.) Evans is also no longer working for The Crash. The WON also mentions Mesias was initially told he was winning his first round Rey de Reyes match and then losing in the final. That changed during the day, and included an AAA front office person being what Mesias felt was disrespectful, which convinced Mesias to leave once Lucha Underground Season 4 was over. Since there’s space to fill, this is a decent enough place to note I’m going to New Orleans the next couple of days for WrestleMania weekend shows. I’ll probably write a “Friday” update tonight, and I should be back in time to write something on Sunday. Maybe nothing on Saturday. 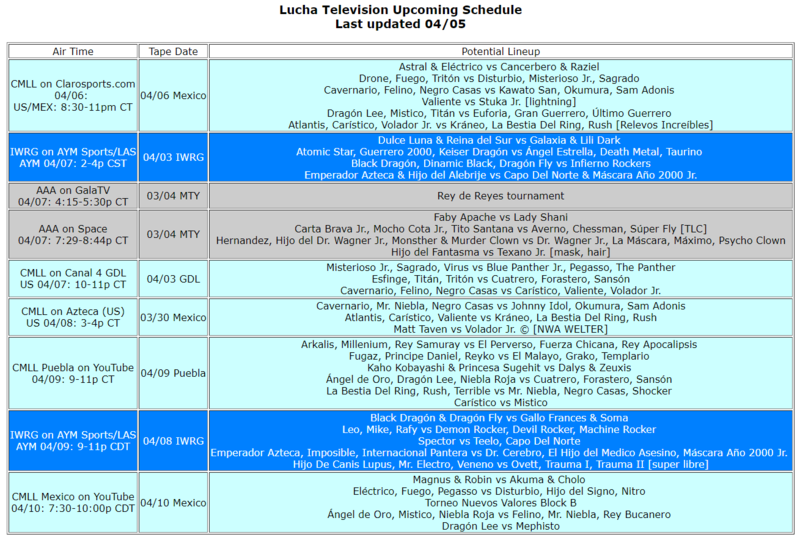 I hope MarcaClaro has their feed working right this week, but you should just go watch the LU/Impact show or find something else to do instead of relying on me to stream if it’s geoblocked. MDA announced LA Park vs Mesias vs Rush on 04/29 in Arena Coliseo Monterrey. Also, MDA, Lucha Libre Boom and Lucha Memes announced they’ll be working together on a show soon. 5) Emperador Azteca, Imposible, Internacional Pantera vs Dr. Cerebro, El Hijo del Medico Asesino, Máscara Año 2000 Jr.
There’s a lot of people here who I haven’t bothered to set up much for. The Fake indie Soul Rockers were Devil/Machine/Soul, so Demon being in the group means either Ultimo Gladiador has joined up or maybe there’s a lot more fakes? That AAA has gone after Penta & Fenix and others for using names that they feel are two similar to the ones they own and have seemingly never gone after these Rockers – never even trademarked the names as far as I can tell – is quite a thing. I’m not looking for AAA to go after these guys either, but if they can let them go them use these characters, it’s hard to see how the characters are an issue. It’s been hinted to me that there’s some deal to allow these non-AAA guys use AAA’s characters, but it feels like that should be offered to everyone or it comes off as vindictive. CMLL almost always avoids doing a singles match on a show with a lot other singles matches. It makes for a really long card. This is an exception, but it also might be a reason to keep your expectations in check for a Dragon Lee match. Still nice we’re getting one. Principe Odin Jr. has a new character, but they’re still acknowledging he used to be Artillero and has been around since 2005 under his previous name. He is not a new star in any manner of speaking. He’ll still probably lose in the first round, and it’s more a problem to likes of Thunder Storm and Ikaro who work the trainee shows but can’t break the actual roster. That block is about as wide open as it can be. Magia Blanca appears on shows a bit more often than the rest of the actual rookies and has been around a little bit longer, but he’s not really pushed. The Guadalajara crew (Fugaz, Principe Daniel, and Reyko) have one YouTube match between them, so no idea what to expect from them. A rudo would normally make sense as a base for Flyer, but Coyote & Maquiavelvo haven’t been that much better than anyone else on this list. Diario Basta interviews Principe Diamante, Magia Blanca, and Maquiavelo about the tournament. Maquiavelo talks about Audaz as a guy he has to beat, so he didn’t know about the changed field when that was done. Principe Diamante says he started training with CMLL in 2010, which means it took six years for him to crack the roster.